In my approximately 32 years of being a reader, it’s only in this past year that I’ve begun to actively track what I read. Sure, I’ve used Goodreads for years and would occasionally update my list when I remembered, but if you asked me to name how many (and which) books I read in a given year, I’d be at a loss. 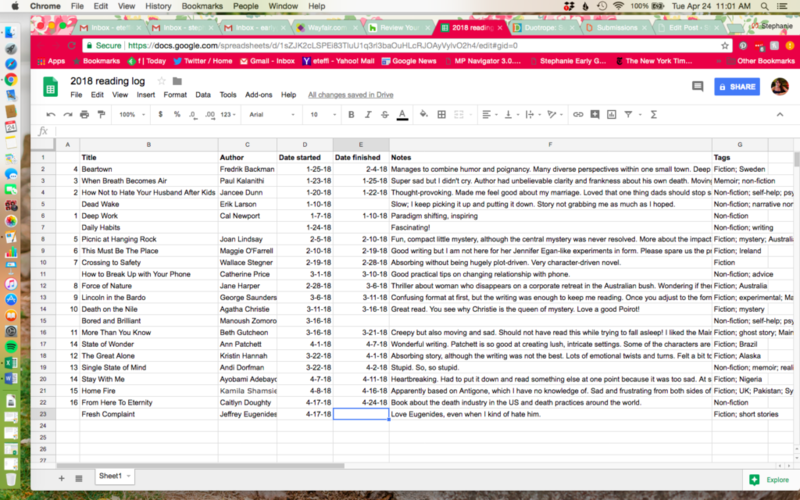 But in January of 2018, I started a Google spreadsheet to track my reading in a more structured way. And the results of my year in reading are here, for all to see. 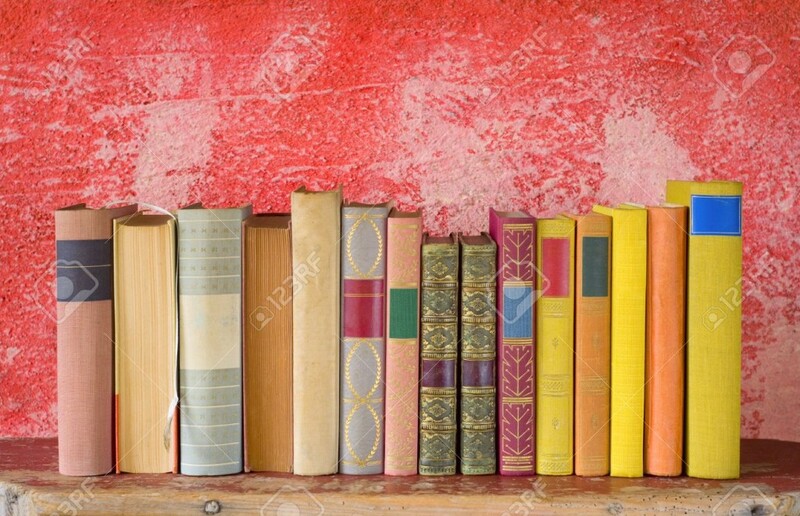 In total, I finished 47 books, including fiction and non-fiction. 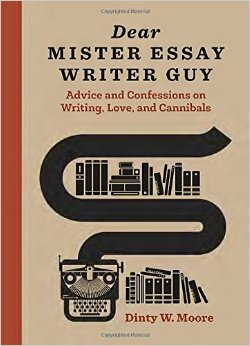 I read novels of all descriptions, short-fiction collections, memoirs, compilations, self-help, investigative journalism, and true crime. Overall, I’m happy with how broadly I read, although there are, as always, a ton of books on my To Be Read list that I wished I’d gotten to this year but didn’t have time for. Favorite non-fiction book: Bad Blood by John Carreyrou. This book is a fascinating, thrilling look into the twisted story of Elizabeth Holmes and Theranos. And here I am discussing this book on The Blotter Presents! Favorite short-story collection: This Cake is for the Party, by Sarah Selecky. I loved Selecky’s collection so much, but I read a lot of fantastic short-fiction this year, including great collections by Jeffrey Eugenides, Lauren Groff, and Nafissa Thompson. Most surprising read: Delicious Foods, by James Hanaham. 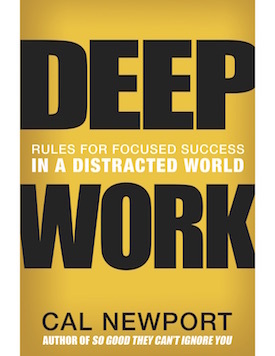 So hard to describe this book in a way that doesn’t make it sound insane (for example, one of the narrators is the drug crack cocaine), but it is one of the books that stuck with me most this entire year. (Thanks to Yohanca Delgado for the recommendation). Stupidest read: Single State of Mind, by Andi Dorfman. In my defense, I didn’t pay for this book with my own money, so I feel morally absolved for wasting brain cells on this dross. 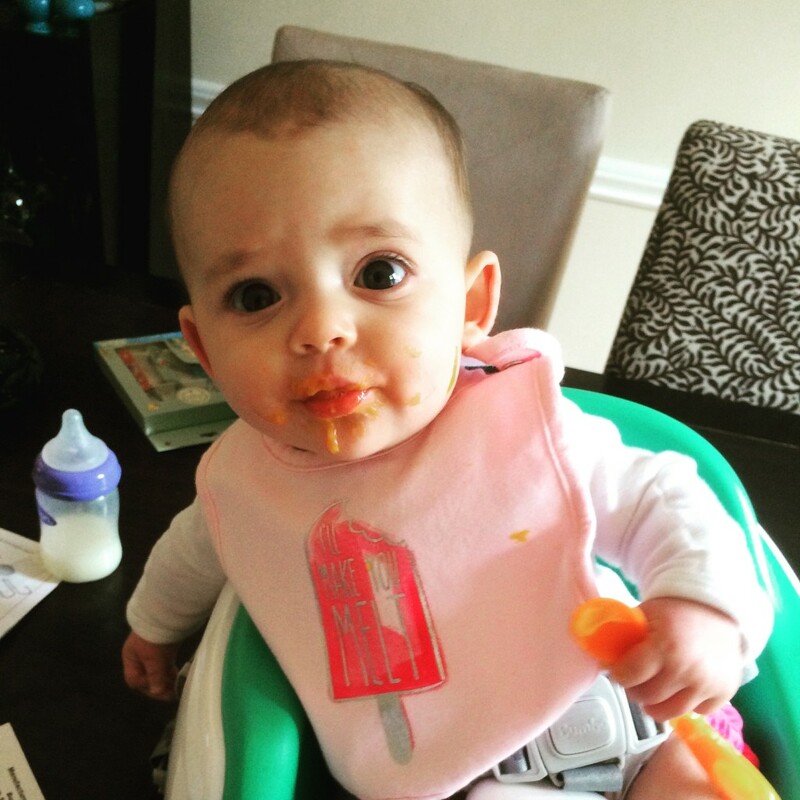 Favorite memoir: And Now We Have Everything, by Meaghan O’Connell. A must-read for mothers. Worst ending: State of Wonder, by Ann Patchett. I hate-hate-HATED the ending but enjoyed the book up until the very end. Best (fiction) page-turner: The Woman in the Window, by A.J. Finn. I saw some of the big twists in this book coming, but I really enjoyed it nonetheless! I’d love to talk to you about your thoughts on any of these books, or others that changed your life this year. What was your best book of 2018? This entry was posted in Books and tagged 2018, books, reading on January 1, 2019 by Stephanie. 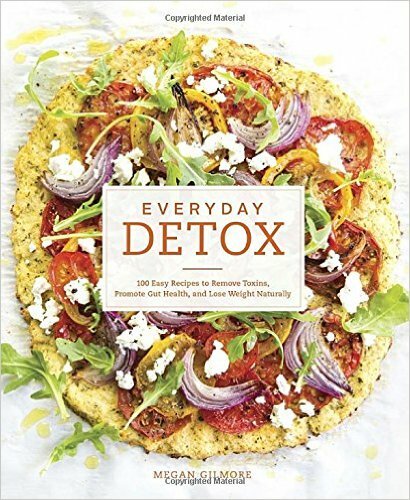 As someone who’s naturally suspicious of the word “detox” outside of the context of recovery from alcohol and drug addiction, I was a bit trepidatious when I first received Megan Gilmore’s cookbook, Everyday Detox. I think “detox” — as in, clearing one’s body of “toxins” — is one of those woo-woo concepts that doesn’t actually have any basis in science, and my hackles go up when people talk about “detox diets,” because what does that even mean? But, in paging through Gilmore’s book, I saw that there was a whole chapter devoted to “liquid nourishment,” and, being a smoothie fanatic, I couldn’t resist trying some of her recipes right away, pseudoscience or no! (Also, to be fair, Gilmore explains her “detox” philosophy in the beginning of her book by saying that she’s in favor of consuming fresh, whole foods, rather than packaged foods that are “loaded with preservatives and chemicals,” which is reasonable, and not what I typically associate with the word “detox”). A creature of habit, I make almost the exact same smoothie for lunch every day, which I like, but I needed to shake things up (pun very much intended!). I cracked open Everyday Detox and started with the Chocolate Chia Shake, which is gluten free, dairy free, soy free, egg free, and vegan (none of which are dietary requirements for me, but nice to know). This recipe did require a trip to the local fancy grocery store to purchase chia seeds and raw cacao nibs, but, as it turns out, the investment was totally worth it because this sucker was DELICIOUS. Even my mother, a professed hater of dates, liked this shake, and one of its main ingredients is dates. That’s how good it was! Emboldened, I moved on to the Banana Nut Protein Shake, which knocked my socks off. Despite involving several handfuls of spinach and two tablespoons of hemp hearts (? ), it was rich and tasty and satisfying. I loved every sip. 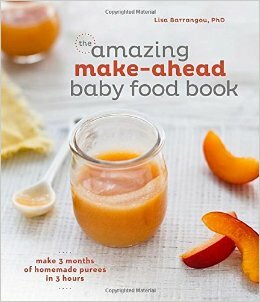 I haven’t yet had a chance to try any of the non-liquid recipes in the book. I will admit that the names of some of the dishes have me a little gun-shy (whenever I see a recipe for “rice,” in quotation marks, I get nervous), but given how phenomenal the two recipes I’ve tried so far have been, I think I need to put my skepticism aside and try more of the ideas in Everyday Detox. I’m looking forward to giving the Peppermint Fudge Bars a whirl, and the Salt And Vinegar Brussels Sprouts also sound delicious. Overall, I’d recommend this book for those looking for healthy, fresh meal ideas who aren’t put off by a few hemp hearts here and there. 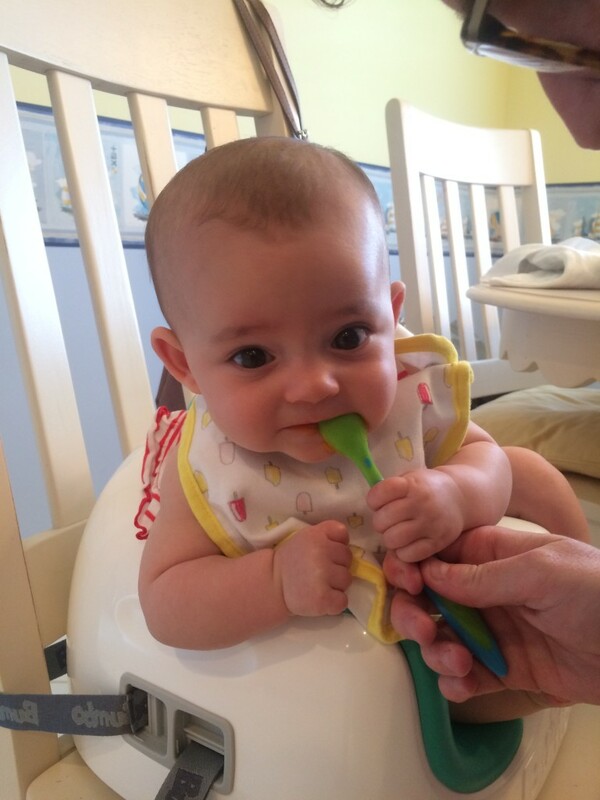 This entry was posted in Books, Food and drink and tagged books, cookbook, Everyday Detox, food, health, Megan Gilmore on August 14, 2015 by Stephanie.